And one of the northern locations is Castle Braverock (destroyed). 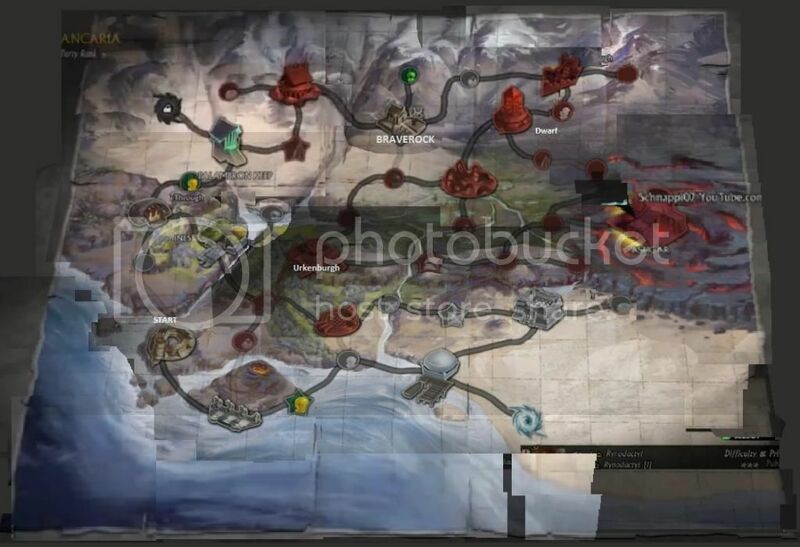 Sacred 3 uses the Sacred 1 map without the Underworld expansion. They couldn't even do the mission select screen right. 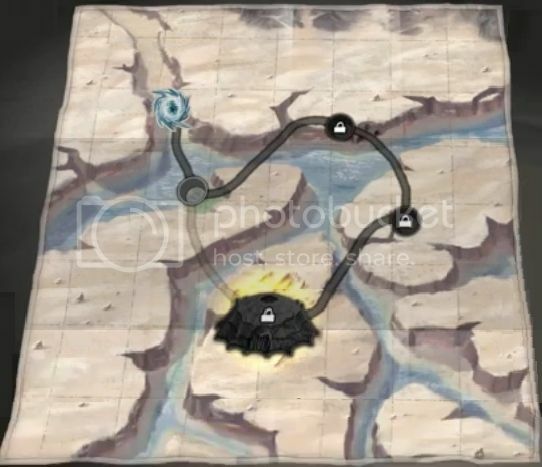 If you look at the map, you will notice that the gray path is one-way corridor most of the time and you have to play the game in a strict order. The tiny shortcut paths are probably there for convenience than diversity. So you have to go from the south to center to west to north to center to the east. There is not enough humor in the game to make up for it,.. even the chihuahua. This game is worse than what they said – it only has minimal first game of lore, and is regurgitated Dungeon Siege 2 in atmosphere. The game seems like it is pretty much what the developers said it was going to be all along! I like how even when the first snippets of info came out several years ago about the game, people immediately were like "Oh my gosh! Don't do it like that!" but they clearly ignored ALL feedback! No temple guardians!? That was my favorite class in Sacred 2! Of course I knew they wouldn't be a playable class for awhile now, but none at all and not even a cameo? I have this reserved for preorder...starting to consider canceling it. I thought it would at least be a fun solid beat-em-up. This game is a 1 step forward, 2 steps back abomination. Every time there is something good, there are 2 fails just around the corner. One completely predictable castle surrounded by lava... THAT IS ALL that was there. And that castle is just a 3 old boss rush and 2 final boss battle. Half an hour long. And the the ending cinematic was weak. The game is a day long. 2 The Last Dwarf – most likely the PC from S1. You meet him for only 1 main quest mission, in Zhurag, which is 3/4 through the game. Well, to tell you the truth, that wasn't my first impression when I saw the map. When we were first shown a glimpse of it in the opening cinematic, with a sort of "evil darkness" spreading east to west I immediately thought about the official Lord of the Rings Middle Earth map, which often was printed with the books. The reveal of the lava place with the capital of evil empire exactly in the place where Mordor is supposed to be only confirmed my suspicion. 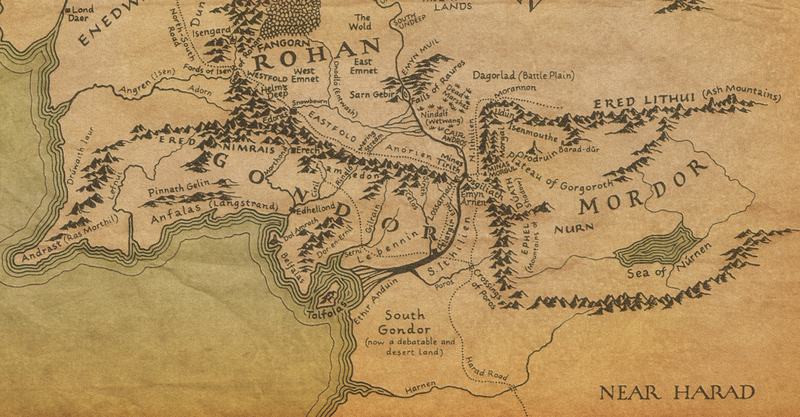 Just compare it to the map of S3 - even the rivers and mountain ridges are placed similarly and we have desert and swamp where LotR map tells us they are. So I'm not even sure they used Sacred 1 map as an inspiration for this game. That was also my first impression. And the more I look at it, the more it sinks in. They actually went and made day-one DLC for this game? Turns out those locked 2 portals were DLC map expansions. Has about 1 hour of content. New spirit - Vampiress. The Last Dwarf replaces Aria as the main narrator. 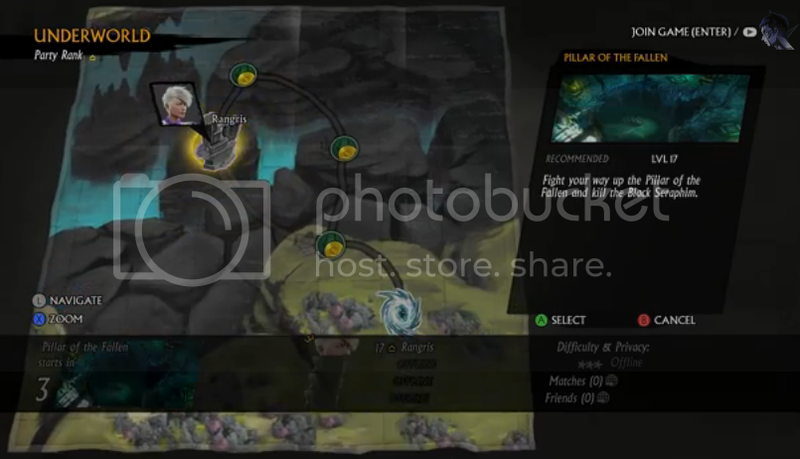 And you get to fight the Old Black Seraphim as the Underwold ruler. In a way it's an improvement to the main campaign, but that's not saying much. Number of Temple Guardians: yes, I'm making it into a running joke now. Oh my.. A Chihuahua!?!?! I gotta get this game! <SMACK!> OK.. slapped myself.. MUCH better..! Dwarves.. You're not likely going to find too many. This is supposed to be a sequel to Sacred 1 and as such, the Dwarves had become extinct - except for the one in the Underworld Expansion. In fact, they were long extinct in the era of Sacred 2 which is a prequel to Sacred 1. Temple Guardians - given they didn't exist in Sacred 1, it can be presumed they too were extinct Don't forget, the TG in Sacred 2 wasn't looking too swift at the start of the game. Coughing, wheezing, falling over. etc.. I thought the dwarves were just sitting underground in Sacred 2 and came out after the events of the game. Then in 2 millennia between the games they got exterminated. Otherwise the last dwarf is an immortal. As for the TG PC, do remember that he was buried alive for who know how long. The starter temple got covered in dirt and vegetation to the point of trees growing on top of it. And in the human region the crazy test dragons in the labs were a thousand years old. My guess would be, the TG got buried at the start of the great war. On the other hand, the newer TGs are well maintained and functional. Every store has all the parts: heads, arms, legs, feet, torsos, batteries. Have any of you considered building several TG just out of the parts alone? The only problem would be their T-Energy batteries, as the endings of the game removes most of the T-Energy from the world. So there are 2 reasonable theories where the TGs are in S1 and S3. 1 TGs moved again, somewhere more isolated. 2 TGs are in hibernation, locked away in huge vault. 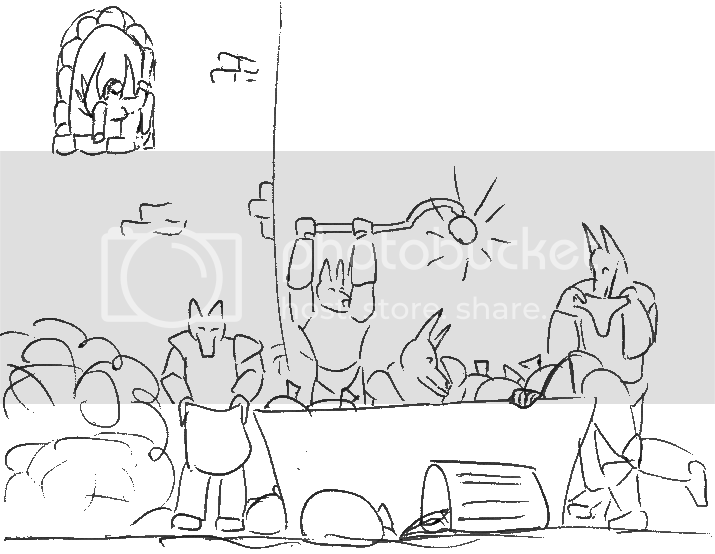 The Sheraphims don’t want to wake them up, believing TGs will contest them for world power, or at the least annoy everyone by going through everything like raccoons. Bottom right portal is inaccessible,the game was giving an info about a dlc installment.There was no purchasable dlc at that time. Hmm. My daughter bought the game before enough information was available. She just loaned it to me (PS3 version) and I played about 5-10 minutes and went back to Skyrim. Not impressed, though I will have to play it again for longer to give it an honest try. I have it available after all. I like this theme much better than the normal theme. I can actually see the text when creating and reading posts! However, I do recall in Underworld, there's some lore having to do with the Dwarves being sucked into the Underworld by Anducar. There is no actual reference to WHEN that happened. As to the last dwarf, our hero from Sacred 1 Underworld, I think there may be other explanations as to why he, alone survived. If you recall the opening story, he crash lands in some sort of flying machine that looks sort of like a helicopter of some sort and is somewhat clueless as to where he is. As such, I have a theory of what happened and how... Time Travel! The dwarf came from a point in time before Sacred 2... Back when Dwarves still existed... And somehow, through some miracle, he got transported through time and space, only to wind up at the start of Sacred 1. TGs: For what it's worth, our hero TG does a bang up job of wiping out most of the TGs in Ancaria on his class quest. The rest are mopped up when you get to the last part of the wastelands and the great machine complex. Given the hero TG is, for all intents and purposes the last survivor, and his physical state, it's likely he's fallen apart or at least, broken down. And I think that I'd kinda loved to see that decimation happen with today's mobb, graphics abilities... like that scene from Matrix where Neo takes out all those many hundreds of Mister Smiths? TGs are eternal machines made by Testa. Machines can be repaired and reprogrammed. And the Great Machine facility got drained of its power, not destroyed. Closer to the end of the TG chainquest the race splits into two factions. You even meet your supporters (3 TGs and 1 Flying Dragon) in the dryad island facility. There is also a TG merchant in the great machine. In addition to this, unlike the Seraphim, TGs respawn like any other enemy. So it stands to reason that there may be a TG manufacturing facility inside the Great Machine. So both scenarios described earlier are plausible. Finaly got around to checing out the Orcland Story letsplays. Just 1 boring hour of whacking orcs in the face. 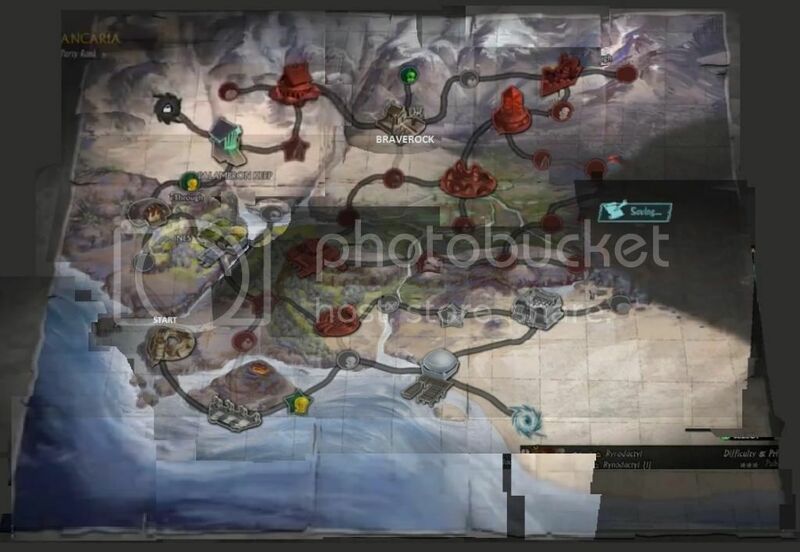 Here is the map of the DLC.